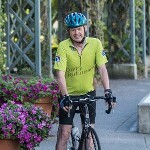 For the last 15 years I have had the support of my wonderful family and great friends in riding and raising funds for Northwest Parkinsons Foundation. This year I have decided to switch my efforts over to the American Parkinson Disease Association, Washington Chapter, and their mission to “Ease the Burden, and Find the Cure." With APDA, I am directing funds raised here to go straight to research for a cure. APDA is a longtime supporter of the Registry, since it began in 2007. This research registry is a vital link in getting new treatments and drugs out of the lab and into the community. It supplies researchers with people who have Parkinson's and want to volunteer for clinical trials, which is often the biggest barrier to successful research. Each successful trial gets us that much closer to a cure. Thank you for visiting my personal Fundraising Page for this year's ride! Please help me reach my goal by making an online gift today!